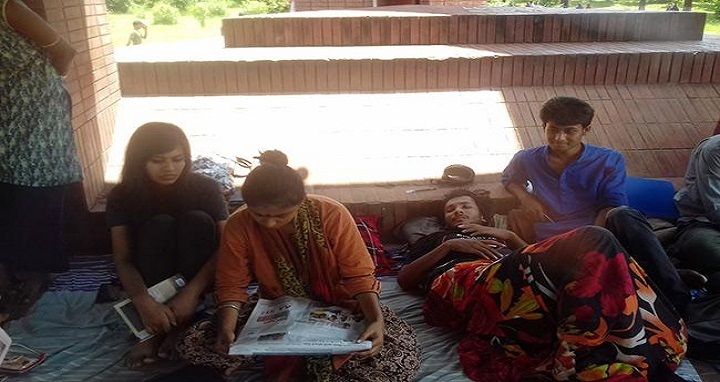 JU, July 16, Abnews: Four students of Jahangirnagar University (JU) continued their fast unto death on the campus for the second consecutive day demanding withdrawal of a case filed against 56 students. They are Puja Biswas, a 40th batch student of International Relations, Sarder Zahid and Tuli, 42nd batch students of English department and Arman, a 43rd batch student of Law and Justice department. The four students began their fast unto death at 2:00 pm on Saturday at the Central Shaheed Minar premises on the campus. Contacted, pro-VC professor Amir Hossian said, "Now, I am in Dhaka. I will inquire into the matter after arrival on the campus." Earlier, students brought out a silent procession on July 11 and staged a human chain on July 9 demanding withdrawal of the case. On May 26, agitating students blocked Dhaka-Aricha highway for six hours following the deaths of two fellow students in a road accident in Savar. But police fired rubber bullets and tear gas shells to disperse them. Later, the students besieged and ransacked the VC's residence protesting police attack on them. Later on May 27, university administration filed a case against 56 students bringing the allegation of vandalising the VC's house.